Sports page editorial about yesterday's headlines that the NBA Players Assn was threatening to sue to keep next year's game out of New Orleans. What if all the Blackberries in the world went nuts. There is a link there to a patch for Blackberry, WinMobile and Smartphone OS. Hey, World Class is not missing your appointments. [the Berkshire region's] great socioeconomic experiment, one in which several dozen businesses agreed to include an alternative currency in their daily transactions and give a discount to those who used it. Now people can pay for groceries, an oil change, even dental work with currency bearing the likenesses of local heroes like Herman Melville and Norman Rockwell. Wanna support local businesses? Pay them in New Orleans's (or West Florida's) own currency. The Crescent City Farmer's Market has a micro version of this, but I think we ought to do this city (or region) wide. The new First NBC or First Bank could be the issuing bank. In BerkShares, they have bills with pictures of W.E.B. Dubois and Herman Melville. We get to pick the people on the bills: Huey Long, Jean Lafitte, Louis Armstrong, Walker Percy, and so on . . . 100 = a Huey, 50 = a Privateer, 20 = a Louie, 10 = a Walker. We could also let tourists exchange alien dollars for them at the airport and rental car places too. Whaddya think? Sinn Fein. I met Andres many years ago when I was in College. I had read about Seaside in the Atlantic in the library of my high school. He's a bright guy. See his article, it is quite interesting. New Orleans resembles Genoa or Marseilles, or Beirut or the Egyptian Alexandria more than it does New York... Like Havana and Port-au-Prince, New Orleans is within the orbit of a Hellenistic world that never touched the North Atlantic. The Mediterranean, Caribbean and Gulf of Mexico form a homogeneous, though interrupted, sea. H/T Stephen Smith for the quote. The Only Way This Could Be Better . . .
is if he mentioned the federal embarrassment in New Orleans. We need a song, Mr. Newman. An interesting piece from NPR; Excellent article. 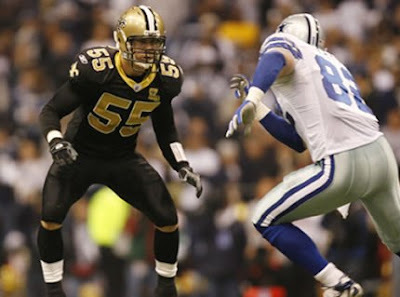 Look, this is World Class New Orleans, after all. I've got to exude some positive. But let's just suppose good stuff is happening, thanks to the exuberance and tenacity of citizens, but no thanks to much that the gubmint does. Napoleon from Claiborne to Fontainebleau looks amazing--a new old neighborhood, thanks to people working hard. Carnival was just awesome this year, and people are still feelin' it. We did it, y'all--from the krewes to da people in da street. It felt great and wonderful and truly ours--we just knew no other city was feelin' what we felt like over the past couple of weeks. Yes, we're still hosed. Today I watched Ivor van Heerden on Cox public access channel 10 doing his presentation to St. Bernard Parish a couple of weeks ago. We're still not ready for a hurricane, thanks to a pathetic president and a late-to-the-party Corps. But there's still something special here, and we're getting our thing back, whatever that is. From left to right: Dr. C(arnival); Professor N.O. 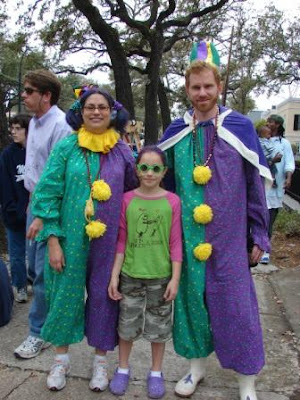 ; and Carnivus, High Priest of Mardi Gras. This article makes an interesting counter-point to NBA Commissioner Stern's rather snide comments about New Orleans last week; read it and see if you agree with the article or with Stern. Here is a quip about why it won't be in Arlington, Texas anytime soon. If you delve into the comments at the end of the article, you will see a quip from yours truly trying to keep em honest. Long live New Orleans a concise op-ed from Seattle -- Leaving us out of the State of the Union was a grave error. It will not fade away any more than 'Mission Accomplished' has. 1. From MM: Exile is a rotten place to be today. 2. From MC: It's in ya hawt, Mr. Mel. You're carrying it wit' ya wherever you are, and so you got it all over the people you'll be seeing it today. 3. Just remember this pic. The Jefferson City Buzzards begin a march not far from my house and end up in the Quarter. This ragtag bunch of male ne'er-do-wells bring Carnival irrelevance to everyone they encounter on their route. As Dilly (pictured left below with our friend Sean) says: "We do it because it must be done." I rolled out of bed at 7:25 a.m. and went to get the T-P on my porch. And heard music. I hopped on my bike rode three blocks, and took this picture. That's Mardi Gras. Hurry take me to the Mardi Gras in the city of my dreams. You can legalize your lows; You can wear your summer clothes in the New Orleans. And when I wear that starry crown, I won't be wanting anymore. Take your burdens to the Mardi Gras; let the music wash your soul. You can mingle in the street; you can jingle to the beat of Jelly Roll. Tumba, tumba, tumba, Mardi GrasTumba, tumba, tumba, day. All you could hear, the people say was Oh Bah Lea. And all you could hear, all night and all day was Oh Bah Lea. New Orleans has lost so much . . . But we're gaining too. And we still have . 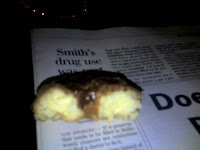 . .
Tastee Donuts, specifically the chocolate frosted cake Tastee Donut. And the Tastee's on Vets still makes the basic McKenzie's King Cake, complete with the green and white McKenzie's label. 1. When I was 10 or so and my brothers were 8 and 6, respectively (Berto being 6), I remember wanting to go to Bacchus and my parents saying that we couldn't. Although my mom grew up a city girl, I remember her citing the crowds and evening start-time and traffic (we lived on the Westbank) as reasons why we couldn't go. Having the God of Wine as taboo started the whole magical attraction. I also remember not feeling intimidated at all by the idea of "city crowds" and feeling aggravated that car traffic separated us from such an Important Carnival Event. 2. We moved overseas for four years after that. By the time we returned, I was 15 and my uncle was a member. My parents had mellowed (also, we boys had gotten older), and so we started going to Bacchus, with my godfather's house only two blocks from Napoleon. My uncle ensured that we caught a lot. That was great, and at the time he was the only person my family knew who regularly rode in a krewe. 3. 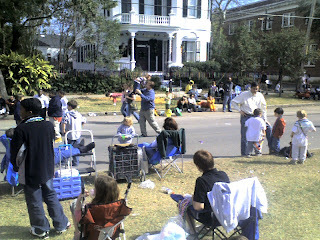 For awhile in college, I lived on Magazine Street on the Thoth route. 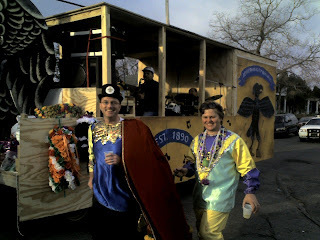 One of the greatest days of my life involved my first real parade route party at MY place, followed by a date with my hot girlfriend to the Bacchus ball. I later married that hot girlfriend. How can one NOT fall in love with a parade when it's part of your marital biography? 4. Almost every year, I really like celebrities they choose (Jackie Gleason, the Fonz, Shatner, Frodo, Drew Brees). Most of the time, I just seem to be on the same wavelength with whoever picks their superstars. Okay, here's my negative post so that I can be positive for the rest of Carnival weekend. I just took these on Napoleon, around Perrier, at noon or so. The Endymion people Jeffery talks about have invaded and set up shop. Note the ENORMOUS blue tarp marking off a huge swath of public property for private use. 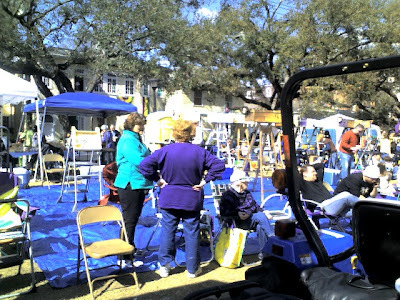 Note the carefully arranged lawn chairs that blocked off a swimming pool sized area of the neutral ground for private use. Help me in a cause: be sure to cut through areas like this and ignore the angry looks and comments that ensue. This letter to the editor and the front pager on the NYT today about the brain drain from New Orleans are points on what might be called an evolving consensus that the message being sent by the voters last November is not getting through in Washington. Since the election, I think the victorious Democrats have failed to show leadership and to suggest new approaches to either of the 800 lb problems that helped to get them elected, Iraq and Katrina. They have criticized the festering problems, but have refused to get their hands dirty on the hard work to fix them. That's probably because Congress is a supremely provincial institution and all Congressional politics is local -- unless there is publicity or ambition involved. But, nothing would look more presidential than for someone running for President to fill the vacuum left in the contrails of Air Force One's apres flood flyover; namely, to get on the ground, to stay on the ground , to make things happen and build hope. Though it is a noble effort, should we really depend on movie stars and talk show hosts to lead the way in resurrecting New Orleans? We need an FDR, and we get a more corrupt and incompetent version of Warren G. Harding as the incumbent. So far, the challengers are making like Calvin Coolidge and James Buchanan (if they look away long enough, maybe the problem will go away). The owner of the New Orleans Saints called out my name and threw me a long strand of beads. Then, just as quickly, you lose a round with Carnival Cruise Lines and the modestly named Triumph. Why can't somebody step up and be the coherent messenger of what is and what is not. There are things you can control, and things you can't. Who can be a voice of both bad and good that inspires hope in all who hear it. Why don't we pardon Edwin Edwards and put him in front of a microphone? Signs of things to come...??? Nice Dylan quote on this op ed piece from today. What happens when you invest in world class flood protection? You get the happiest children around. Imagine what we'd get with Dutch-style flood protection PLUS Carnival. Yes, it's obvious, but this is the only kind of Fujita Scale I ever want to hear about in reference to World Class New Orleans (and Westwego). Aaron helps us see how the devastation happened. I drove over to the 7800 block or so of Burthe, Freret, Maple, etc. Bad stuff over there: roofs off of some houses, the entire front of a house gone (you can look into the open front, which has been peeled off, like a weird dollhouse). Wires and sheet metal strewn about. The tornado(es) really did seem to skip about--a hit here, a miss there. Even on River Road at Uptown Square there are trees uprooted. One large tree (or piece of one) had been picked up and deposited on top of a parked SUV. That's the thing that bothers me about living in a recovering area: Life don't stop. Tornadoes still happen; people still have cancer and heart attacks. Wish we could get a pass from the regular garbage that people usually have to deal with. I hope the people in Carrollton, Westwego, and Pontchartrain Park who got hit have help and are feeling like tough mofos today. As you can see from this picture I took yesterday on Napoleon Avenue during the Carrollton and King Arthur parades, Mardi Gras is no place for kids and families. We need to set up a separated, segregated event in the 'burbs and bring in acts like Tony Orlando in order to ensure that there are kid-friendly activities here at Carnival Time. My kids were out there, but I was deathly afraid the whole time. There I was, minding my own business, looking for New Orleans songs on iTunes, when I stumbled on this piece of crap. When Ray Stevens gets off his knees and stops servicing President George W. Bush, maybe he can read a newspaper and figure out what's actually going on. What scares me is that I think he is accurately reflecting the sentiments of many of our "brothers" in the Deep South. I was looking for New Orleans related songs on iTunes, when I stumbled on your "New Battle of New Orleans." I credit you for trying to update a classic. However, your new lyrics, while skewering people who deserve to be skewered (looters), let the President and others completely off the hook. I am not a member of the Democratic Party. I am not a supporter of Jesse Jackson. I live in New Orleans. We have been utterly failed by EVERY possible institution in our society--government at every level, private insurance companies, and others. Your song implies that the President has been unfairly blamed by us. Trust me. If you were here, you would understand what an total embarrassment he has been. We are busting our butts, doing things on our own, because no one with money and authority cares. Volunteer groups from around the country have been amazing. However, I thought I lived in a nation-state--not an association of volunteers. All Americans should be ashamed of what is happening here. In general, I appreciate your sense of humor, and I am in no way offended at your attempt to make some laughs about your situation. However, please evaluate the situation on the ground here, and then turn your wit on the empty suits who are "running" this country. Metairie is staging Family Gras. This is to give the kids a nice safe venue to see Tony Orlando and The Little River Band, before they grow up and need a nice safe venue to see Journey and Styx. This causes me to note that "Family Gras" means "Fat Family." Not sure what to make of that. 2. Yesterday I saw a cheap canopy already set up on St. Charles in the neutral ground. Endymion may bring new meaning to "The Saints Are Coming." I hope they (the krewe) don't ruin it.
. . . I'd prefer to see Endymion back in Mid-City if, for no other reason, than to avoid the uniquely rude and territorial crowd of young white suburban types it tends to draw. The ladder is the bane of my Carnival existence and Endymion fans bring them out in force. But that's not all they bring. Endymion crowds usually begin to gather along the parade route one or two days before the actual parade. 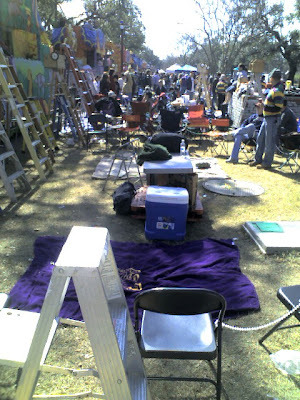 The squatters use ladders, spray paint and rope to claim and defend a plot of real estate on the neutral ground for themselves and their young white larvae. Woe to the parade goer who wishes to travel from one side of the street to the other by crossing the sovereign territory of the Endymion soccer mom. He will be treated to all manner of dirty looks and crude lectures about respecting her roped off piece of public property. This ridiculous sociopathic inability to comprehend the nature of a public event does not belong in Mardi Gras. Unfortunately it has established itself as standard behavior among the yuppies who throng for Endymion. 3. Mr. Mel keeps posting gems from various media around the country. His perspective from outside the morass of Our Fair City provides much to this blog. Clio IV and I were up late one night over the Christmas holidays. On Cox Channel 10, we were able to view the entire showing of Miss Pussycat's North Pole Nutrias. Oh, wow. I want this to be part of my Christmas forever, from now on. As Carnival time descends on us in a most welcome matter, we do well to check Quintron's schedule and look for the dates for the 9th Ward Marching Band. Saturday 2/17: NEW ORLEANS, LA @ The Spellcaster Lodge - Annual Mardi Gras Maritime Ball with Quintron and Miss Pussycat, THE OVERNIGHT LOWS (from Jackson, mississippi), HARRINGBONE (feat Courtney Lane of BABY ROSEBUD), and the one and only KATY RED!!! of Take Fo Records.Also The 9TH WARD MARCHING BAND will make its ruturn to the late night Jackson Square march.Parade begins from the Lodge at around 4 am. Interesting article here. I'll never look at the milk spirals in my coffee without thinking about 'Heckuva Job, Brownie.' again. Take a look. Oh, is there a football game today? Just realized there's a game today. Was too busy watching this. This letter to the editor was an interesting take. Take a peek. Can you tell which is which in the choices below? 1. From Third Battle, we learn about The Onion's take on the status of rebuilding in New Orleans ("FEMA Calls Rebuilding Complete As New Orleans Restored To Former Squalor"). As part of the citywide restoration efforts, downtown medical facilities that flooded during Katrina, such as Charity Hospital, were drained, repaired, and meticulously under-funded based on past financial records and other historical evidence. Hospital officials said the facility could be ill-prepared for overcrowding by uninsured and indigent patients as early as next week. Parents and teachers choose Catholic schools because they want to avoid the unruly, uncooperative, undisciplined and sometimes violent children that comprise some of the public school students. You put these students into the Catholic schools, and you will have many angry parents. Where will you find teachers who will tolerate misbehaving students at a Catholic school salary? Can you put a typical public student in the same grade at a Catholic school and expect him to succeed? Catholic schools have limited resources for helping students outside the classroom. Normally, the parents tutor their children or pay for tutoring. Now maybe if you impose a screening procedure and require placement testing, Catholic schools could educate many public students. But to offer space for any student will ultimately destroy the Catholic school system. The Rev. William Maestri should have spoken to Catholic school principals, teachers and parents before making a public offer to take in public school students, and he should establish minimum standards for accepting these students. I'm not a fan of the Rev. William Maestri's work at the Archdiocese of New Orleans, but his announcement of open arms for the families who were wait-listed by the public schools was one of the best things he's done. I am grateful that Ms. Folse is at least honest about why she and (no doubt) other families (though, thankfully, not all) choose Catholic schools: not because they want to enhance their children's faith lives or instill virtue, but because they're running away from the "unruly" kids. Lovely. Just lovely. After Patrick J. Buchanan, as a conservative candidate for president, declared at the 1992 Republican National Convention that America was engaged in a cultural war, she said his speech "probably sounded better in the original German." Even her friends marveled at how quickly she could drop her Texas voice for what they called her Smith voice. Sometimes she combined the two, as in: "The sine qua non, as we say in Amarillo." In 1976, her writing, which she said was often fueled by "truly impressive amounts of beer," landed her a job at The New York Times. She cut an unusual figure in The Times newsroom, wearing blue jeans, going barefoot and bringing in her dog, whose name was an expletive. Ms. Ivins had just the right voice, humane but sharp as hell. By the way, does anybody know what she called her dog?